Cuyahoga County Public Library (CCPL) recently presented the 2017 edition of Great Books for Kids, its annual holiday gift-giving guide. The list highlights recently published books for kids ages birth through 18 years old. Every book featured in Great Books for Kids has been selected by CCPL librarians and represents the very best titles published over the past year. 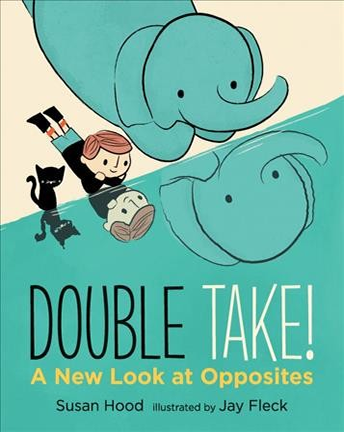 Artwork from the delightful children’s book Double Take! : A New Look at Opposites by Susan Hood, illustrated by Jay Fleck, used with permission of the publisher, Candlewick Press. More than 100 titles recommended by CCPL librarians. Each title is accompanied by a brief synopsis and a list of available formats. A selection of toys available to borrow from CCPL’s toy lending service. A printable “Wish List” feature and links to “Buy It Now” from CCPL’s online book store, www.offtheshelfbooks.org. Try before you buy. All the books featured in Great Books for Kids are available to borrow from CCPL, and many can be previewed in eBook format. For the first time ever, new copies of select Great Books for Kids titles are available for purchase at discounted prices at all CCPL branches, while supplies last. A portion of the proceeds from the sale of Great Books for Kids titles will help support youth literacy programs at the library. On Giving Tuesday (November 28th), CCPL will host two Holiday Pop-Up Shops from 6-8 p.m. at its Parma-Snow and South Euclid-Lyndhurst branches. Parents and caregivers are invited to do some holiday shopping and enjoy refreshments while their children take part in library activities. All ages are welcome to participate, but children who are preschool age or younger must be accompanied by an adult.